Elections in Sierra Leone may be two or three years away, but there is little doubt president Koroma and his ruling APC party, are closely watching developments in Burundi and DR Congo. Both president Nkurunziza of Burundi and Kabila of Congo, are poised to tearing up their country’s constitution in order to contest third term presidential election. 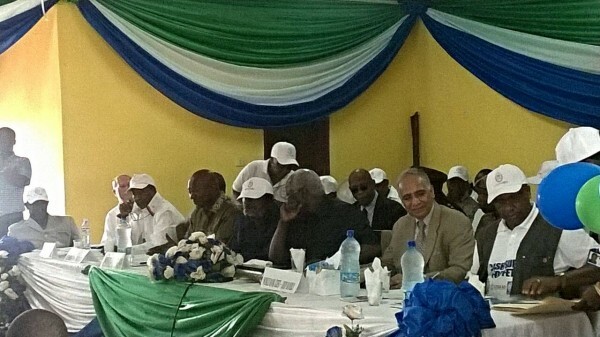 The constitutions of all three countries – Sierra Leone, Burundi and DR Congo, limit presidential terms to two. But with a renewed resurgence of dictatorship now emerging in Africa, it seems the younger generation of African leaders are showing that they are no different from their power hungry predecessors of the 1970s and 1980s. Recent media sound bites and political overtures by president Koroma of Sierra Leone, continue to give mixed messages both at home and abroad, where anti-Koroma sentiment is rapidly growing. But opponents of president Koroma quite simply, have very little faith and confidence in the president. There is strong suspicion that the ruling APC party majority led parliament, may pass a Bill extending the term of office of the president. This move by the APC, if succeeded, could then pave the way and make it difficult for Koroma to turn down a request by his party and constituency delegates from across the country to seek a third term. Political pundits in Sierra Leone however, believe that such political maneuvering will not only be damaging to the country’s democratic image, but will lead to widespread anarchy and violence. In the meantime, latest developments in Burundi should act as a strong deterrent to president Koroma and his ruling APC. 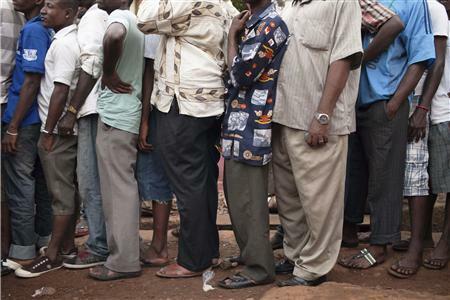 According to a recent report by the International Crisis Group, the elections scheduled to take place in August 2015 will be decisive for Burundi. Popular protests and the precedent set by the fall of Burkina Faso’s president, suggest that street confrontations will become even more violent as President Nkurunziza continues to impose his candidacy, says Crisis Group. 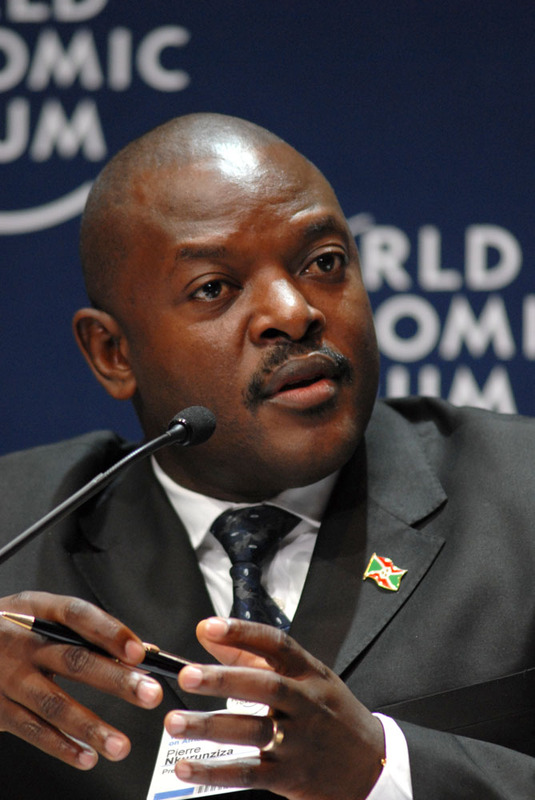 The prospects of a third term for President Nkurunziza (Photo) calls into question the preservation of peace in Burundi. The president is risking it all by trying to force his name on the ballot, against the wishes of the Catholic Church, civil society, a fraction of his own party and most external partners. In DR Congo, “attempts to amend the constitution to allow President Kabila to run for a third term in the 2016 elections have galvanised opposition within and outside the governing majority. The slow pace of election preparations, disputes over voter rolls, deadly protests and clashes earlier this year and an overhasty decentralisation process are adding to an already tense climate in an unstable country,” says Hans Hoebeke, Crisis Group’s Congo Senior Analyst. In its latest report on DR Congo, Crisis Group warns that the presidential and legislative polls scheduled for 2016 are a potential watershed. The prospect of these elections is testing nerves on all sides of the Congolese political spectrum and has already caused deadly violence. Crisis Group says that there is an urgent need for President Joseph Kabila (Photo) to commit to the two-term limit contained within the constitution and ready himself to leave power. Consensus is also needed on key electoral decisions, in particular regarding the calendar and the voter roll. This will require high-level donor and international engagement. Absent agreement and clarity on the election process, or should there be significant delays, international partners should review their support to the government. The fragmented governing majority is running out of options to avoid the 2016 deadline. 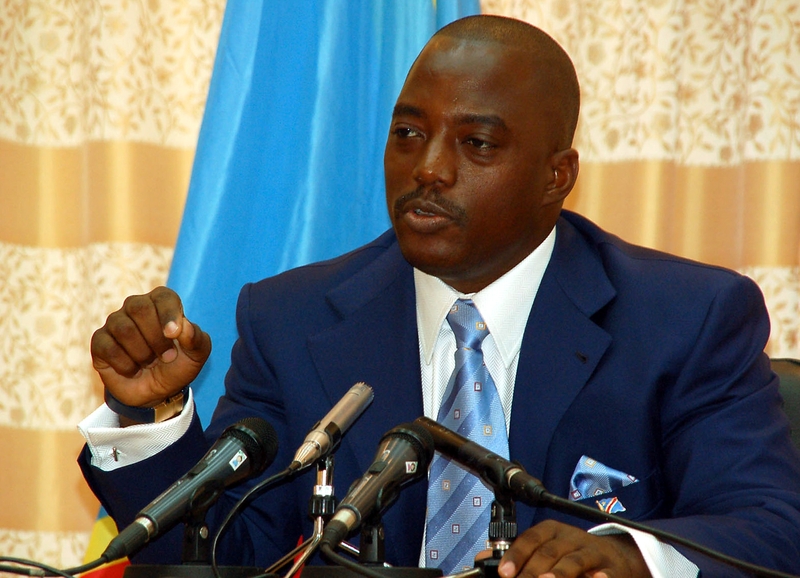 The government’s attempts to amend both the constitution to allow Joseph Kabila to run for a third term and election laws face strong, including internal, opposition, as was evident in the January 2015 mini-political crisis over proposed changes to the electoral law. This mini-crisis, which triggered deadly violence and repression against pro-democracy activists, gave a first hint of what could be in store for 2016. In this tense domestic context, engagement by international actors is met with an increasing insistence on national sovereignty that affects in particular the UN Organization Stabilization Mission in the DRC (MONUSCO). Local and provincial polls planned for 2015, despite a technically insufficient and non-consensual voter list, could undermine credible national elections in 2016. In addition to an overly ambitious and costly electoral calendar, the government is hastily pushing through an under-resourced and ill-prepared decentralisation process, including the division of eleven provinces into 26 as provided for in the 2006 constitution. It aims to finalise in six months what was not achieved during nine years. Trying to pursue decentralisation while implementing the electoral calendar could aggravate local tensions, trigger security troubles ahead of next year’s polls and make the country highly unstable. For the government, buying time by capitalising on potential delays seems to be the highest attainable objective it can presently agree on. The disjointed opposition is incapable of forming a united front, but there is a broad agreement to oppose any political manoeuvring to extend President Kabila’s rule beyond 2016. In addition to President Kabila’s ambiguous signals about whether he will respect his two-term limit, problems experienced during the 2011 elections remain; they include a lack of confidence in the Independent National Electoral Commission (CENI) and a disputed voter list. The democratisation process launched a decade ago is reaching its moment of truth, as the excessive hopes raised by the 2006 elections have not materialised. These were the first, and so far only, reasonably free and fair democratic polls to take place since the country’s independence. In their wake, reform of the nature of politics and government in DRC has been limited. However, at this stage, delaying the 2016 presidential and legislative elections would be equivalent to an unconstitutional extension of the regime. The January 2015 violence in Kinshasa was a clear demonstration of the Congolese population’s aspirations for political change. If the electoral process is not allowed to move forward unhindered, international actors, with a large UN mission in place, risk supporting a regime with even less legitimacy than is currently the case. All efforts have to focus on creating conditions for credible polls in 2016. To that end, Congolese political actors and the CENI should revise the electoral calendar and delay local elections until decentralisation has been fine-tuned, and provincial polls should be organised to closely coincide or be combined with the national elections. A serious conflict prevention and dispute resolution strategy is required, in particular at the local level. Such efforts cannot be only with the electoral horizon in mind. Successful elections do not equal democracy and good governance; the transformation of the Congolese political system has a long way to go and requires a change in governance practices that will be the work of many years. Affirm its commitment to respecting the constitution, in particular the two-term limit for President Kabila, and the timeframe for presidential and legislative elections. Guarantee the right of free expression for the people, civil society and the opposition and abstain from arresting and harassing opponents. Make available to the CENI the necessary financial resources in a transparent manner. Reinforce judicial structures that have election responsibilities, such as the tribunaux de grande instance (civil court) and the Constitutional Court. Open an inclusive dialogue on the nature and speed of decentralisation, in particular the installation of local authorities that will organise local elections in the future. Establish a permanent and institutionalised working dialogue, with the aim of reaching consensus on the electoral calendar, the voter list, the opening of political space, among other issues. Amend the electoral calendar and cancel the completion of the 2011 electoral cycle (provincial, Senate and local elections). Concentrate instead on the organisation of the presidential and legislative polls on 27 November 2016, possibly in combination with provincial elections. Establish in close cooperation with international actors, in particular MONUSCO, an inclusive conflict prevention, security and dispute resolution strategy (including MONUSCO force deployment and local monitoring) as a pre-condition for local elections. Prioritise building and maintaining maximum consensus on the entire electoral process. Communicate regularly and with full transparency its decisions, progress and challenges implementing the electoral calendar through a publically accessible platform and the media. Work transparently with the opposition, electoral experts, civil society and the government on the creation of legitimate and comprehensive voter rolls. Collaborate closely with the media, civil society, the government, opposition and international partners on a public awareness and voter education campaign. Create an inter-party structure to improve coordination on electoral issues. Send a ministerial delegation composed of UN, African Union (AU), EU and U.S. representatives to initiate a dialogue with the president and relevant Congolese stakeholders about the electoral process. Follow up this dialogue with the group of special envoys. The key message should be full commitment to the constitution by the president and government, highlighting that non-compliance would have a serious impact on international support. Streamline the positions of and communication by the ambassadors’ working group coordinated by the special representative of the Secretary-General (SRSG) in Kinshasa. Provide consistent backing to the mandated good offices efforts of the UN special envoy for the Great Lakes Region and the SRSG with regard to the elections. Concentrate financial and material support on voter registration and training of election officials to help ensure the timely and well-organised 2016 presidential and legislative polls, as well as civil society monitoring and voter education. Send adequately staffed, long-term observation missions and ensure close communication and collaboration between them. Assess and review progress in the electoral process, as is foreseen in Security Council Resolution 2211, and suspend support to the electoral process and the Congolese security forces if the president and government continue to prevaricate on the two-term limit. In case of important delays and blatant disregard for the two-term limit, review public development aid and consider revising MONUSCO’s mandate.